A couple of years ago, James Rowen reported that there was some unsavory and tasteless gear at the WISGOP booth at the Wisconsin State Fair. 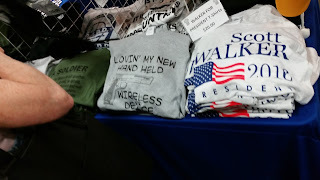 I do wonder if the positioning of the gun shirts near the Walker shirts was deliberate or done subconsciously. 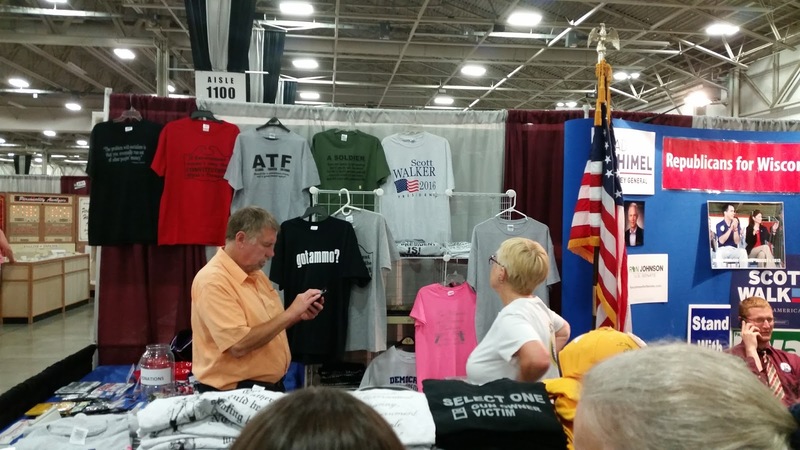 They also had a shirt (not pictured) that said they respect local law enforcement, an obvious dig at the #blacklivesmatter movement. Stay classy, Republicans. Stay classy. Oh boy the left is offended by something, there's a surprise! Regarding your post about no union stuff at the Dem booth I have been informed that there was indeed plenty of union and labor supporting gear on hand. In fact, the Dems has t-shirts that say "Labor is the source of all wealth"... buttons that say "Raise the minimum wage to a living wage" and "Wages: Average workers in RTW states make $5,333 per year less than free bargaining states"... and stickers that say "Living wage now" and "Raise minimum wage to a living wage." And they’ve all been there since the moment the Fair opened. Where is thst post Chris? While you were "informed" that union stuff was there, I was actually there and there was nothing. And I asked one of the people staffing the booth and she could not find anything either. She made a note of it as well. Now what should I believe - your "information" or my lying eyes? Capper - why don't you show pictures of all the nonunion gear to prove your point. You shared plenty of republican booth pictures to prove your point. Why not the Dem booth. Perhaps you don't associate the above mentioned items with a union. Or did you want them to directly support a union like AFSME? May I suggest that your union filters distorted your view. Go ahead - visit the booth - take some pictures and get back to us. In the meantime - set up your own union booth and make sure to have plenty of fist shirts available. I suspect you aren't lying - just jaded by what you want to see and what actually exists. I didn't take pictures because there was nothing to take a picture of. And if the people staffing the booth couldn't find anything either, I really don't think it's me. You would have taken pictures to prove your point. Perhaps your definition of pro union gear is limited to the Blue Fist ? Go ahead - take some pictures - prove me wrong. So you don't think shirts that say "Labor is the source of all wealth"... buttons that say "Raise the minimum wage to a living wage" and "Wages: Average workers in RTW states make $5,333 per year less than free bargaining states"... and stickers that say "Living wage now" and "Raise minimum wage to a living wage are good enough? I certainly hope that my post on Facebook woke them up and they corrected this mistake. Yet you didn't take pictures to prove your point. BTW - the gear mentioned above has been there all the time - since day 1. Find them? What did you ask for? Do you have any union gear? I'm sure they didn't have WEA or AFSME or USW gear as that would be illegal. What exactly were you looking for there Chris? You see what you want to see. Yes, I did ask. My wife and I wanted to buy some like we did the last time we were there. They didn't have anything. So we went on our way. The fact that you're having a conniption about it here and not on my Facebook post tells me you know that I was correct. So you went on your way and promptly posted a negative comment about the Dem booth. Next time take pictures to show what they did have. Those booths are pretty easy to size up without asking. Did you think that had the Blue fist shirts or AFSME shirts hidden. My guess is that you didn't take picitures to avoid being challenged about the shirts supporting labor that were for sale. Conniption? That would be a hysterical fit of anger. Does it appear that I'm angry or are you misinterpreting a challenge to your assertion as such? Is attacking the messenger your regular MO? So you think that by not responding on your FB post proves that you were correct. How so Chris? Why hasn't anyone defended you on here? Have a good night Chris and thanks for all you do. Why should he take pictures you nitwit? I'm defending Chris, so go back to your spot under the bridge, troll, and maybe create your own blog. Dunstan, or whatever your name is, you went out of your way to create a fictitious persona on Google + (who actually uses Google +?). Then you come to a post that has nothing to do with the subject that you want to mewl about. And you wonder why no one (other than Other) would come to defend me here. That's like protesting a Wisconsin law in Mexico and saying you're in the right because no one called you on it. It's bizarre and irrational. Well, to be honest, I could see how you could confuse some Democrats for Republicans. There isn't as much difference between the two anymore. Heck Of A Job Brownie! Who Lobbied The Most For The Bucks Debacle? Walker Has Such A Deal For You! Could Scott Walker Keep America Safe? Confirmed: Scott Walker Is John Doe! Scott Walker Gets His Just Reward!